Each week, Chuck Hester will show you how to use LinkedIn, talk with a guest about their experience in leveraging the platform and bring you a few tips on making the most of the most powerful social business tool on the web. This episode includes a few LinkedIn tips on how you can archive your data on LinkedIn plus how to use the LinkedIn Publishing platform. You can find my LinkedIn blog posts here. I welcome shares and comments on these posts! My guest today is Shel Holtz, co-founder of our podcast network – and host of the For Immediate Release podcast, along with Neville Hobson. In our interview, we talked about an article he published on the skills – or lack thereof – of senior PR professionals. You can read more of Shel’s posts on his site. Don’t forget my new book: Social Media for the Rest of Us: A Boomer’s Perspective is now available for pre-order. Exclusively for my listeners, you can get 25 percent off by using the code: SM4Boomers (case sensitive). FIR presents LinkedConversations with Chuck Hester is brought to you with Lawrence Ragan Communications, serving communicators worldwide for 35 years. Information: www.ragan.com. 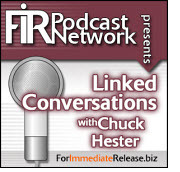 Welcome to the latest episode of Linked Conversations with Chuck Hester. This episode I cover LinkedIn Publishing and the move to open up the feature to all English-speaking members of the site. My guest this week is Chip Griffin, Founder and CEO of CustomScoop, a media monitor software firm. Chip and his organizations create, promote, and analyze effective content in traditional and digital media. A longtime innovator, Chip was recruited from his job on Capitol Hill to serve as CEO of an online media company when he was just 23 years old. Chip is also the host of two podcasts on the FIR Podcast Network – Chats with Chip and Media Bullseye Roundtable. It’s an great compilation of past interviews with some really interesting social media, literary giants and well, a rock star! Don’t forget my new book: Social Media for the Rest of Us: A Boomer’s Perspective is now available for pre-order.. This episode I cover major changes in LinkedIn’s Terms of Service and User Agreement. VERY positive changes, in fact. Here’s a link to the LinkedIn blog post that explains it all. I also cover a recent blog post I wrote on LinkedIn about Reviving the Lost Art of Connecting. You can see it and my other LinkedIn posts here. This episode I’ll talk about SlideShare – a LinkedIn company – that has now opened up its premium features to all users. LinkedIn continues to be a content curation platform, now more than ever with the advent of LinkedIn Publishing – which is where I post on a regular basis. All of my LinkedIn posts can be found here. My very special guest on this episode is Scott Monty, an internationally recognized leader in digital communications, social media and marketing. Scott just recently became the Executive Vice President of Strategy for SHIFT Communications, after leaving his position at Ford Motor Company. Scott was a strategic advisor on crisis communications, blogger relations, digital customer customer service, innovative product launches and more. He writes about the changing landscape of business, technology, communications, marketing and leadership at ScottMonty.com. We cover a wide variety of topics, including: data-driven communications; the integration of communications and marketing; using paid, earned, owned and rented media; content marketing; and influencer and advocacy outreach. It was a great conversation, and I hope you enjoy Scott’s amazing insights! Enjoy the show and thanks for listening and if you like what you hear, spread the word! This episode I’ll talk about LinkedIn’s latest acquistion – the Bizo B2B content marketing platform. I’ll also fill you in on LinkedIn Live Raleigh: Members Conference coming up on September 9 in Raleigh, NC. If you’re in the area and want to attend, be sure to use the code “GODFATHER5” for $5 off at registration. Finally, I’ll share one of my recent blog posts about meeting online connections in person – “Take the Meeting!” All of my LinkedIn posts can be found here.